These Strawberry. 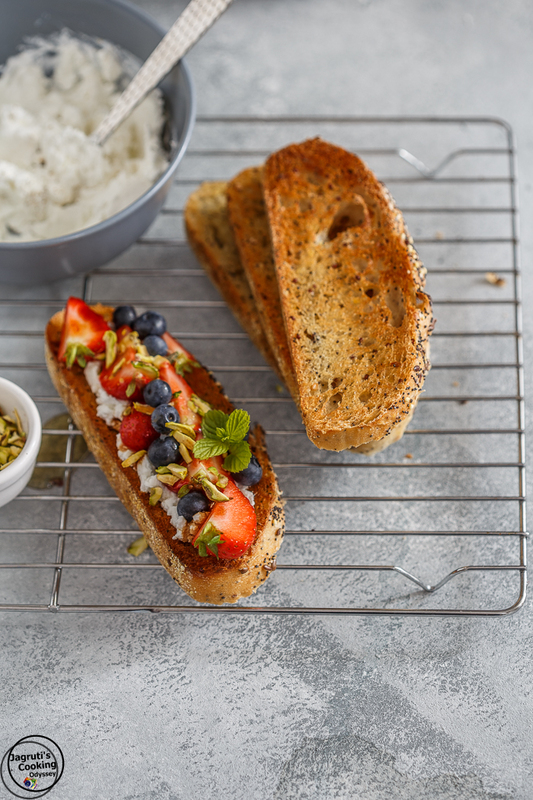 Goat's Cheese and Pistachio Crostini, are one of the easiest items you can prepare for any summer occasion. A scrumptious, sweet and savoury, light and refreshing summer appetizer or a snack. 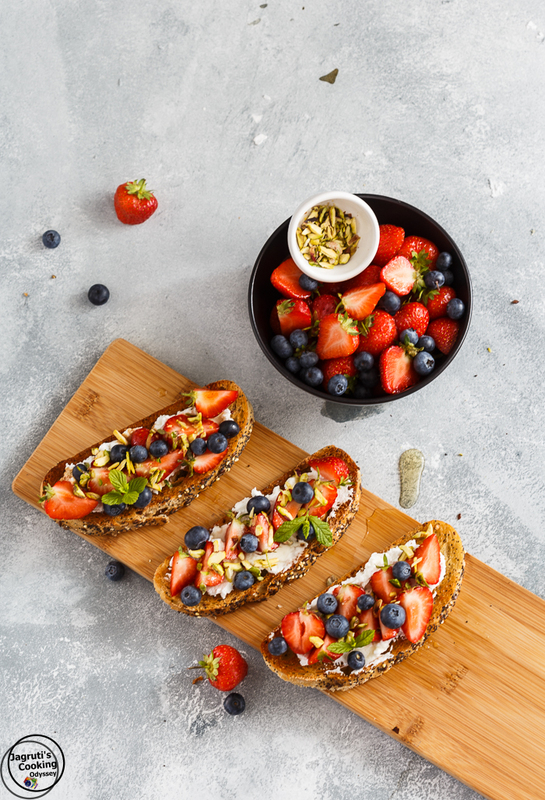 These crostinis are loaded with juicy strawberries, creamy and salty goats' cheese and then garnished with lightly toasted pistachio slivers, balsamic, maple syrup and mint leaves. It's a gorgeous summer treat! Like I said, Crostini is one of the easiest dishes you can prepare in less than 10 minutes. 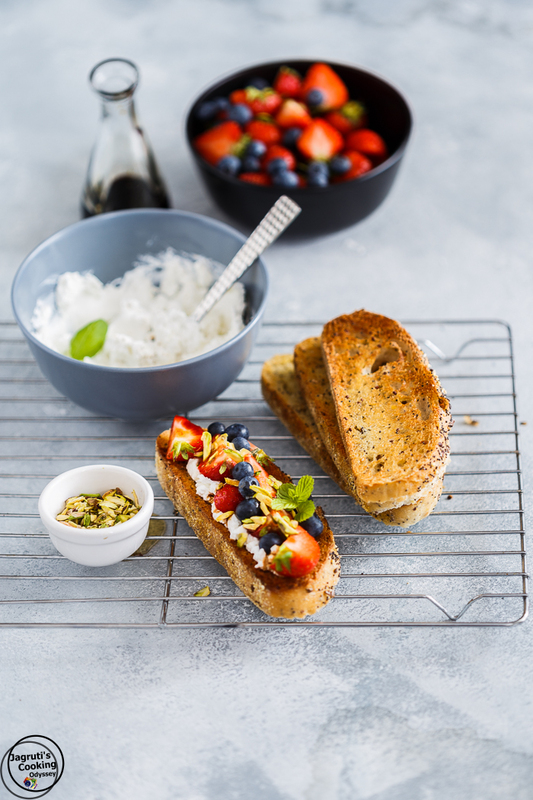 Simply toast or bake some bread with olive oil and pile up with a mixture of ingredients you fancy. This weekend was quite relaxing for us, plenty of cricket matches were scheduled, so while we were watching women's cricket between India and Pakistan, the match between India Vs West Indies was recording on the box. When you are on a binge-watch, you're going to need some snacks and that too quick snacks which you can make in a commercial break. We got little peckish, so I prepared this super tasty crostini and we really enjoyed it, and I quickly clicked a few pics of it. 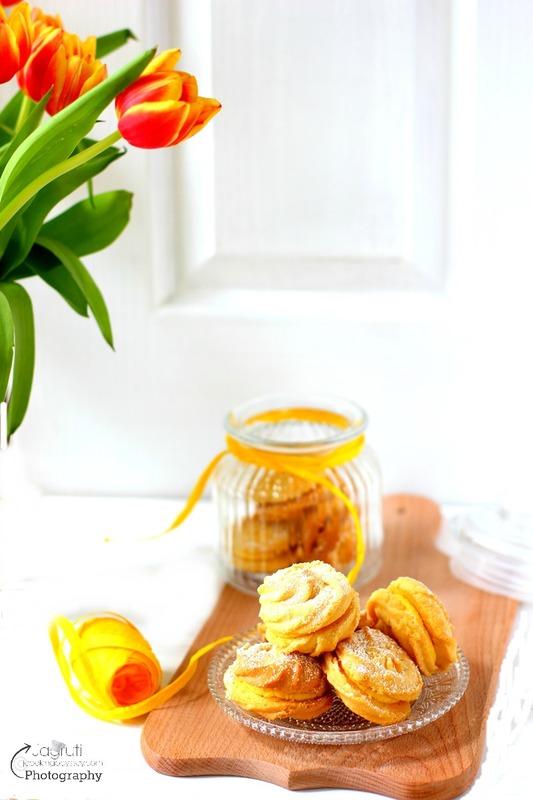 Instead of Maple syrup, you can use honey or agave nectar. If you decide to use strawberry tops ( green leaves) please wash it carefully with plenty of water. Don't like the taste of Balsamic Vinegar, omit it. I had half a punnet of Blueberries, so I decide to use it, maybe you can use this recipe for 4th of July celebrations. 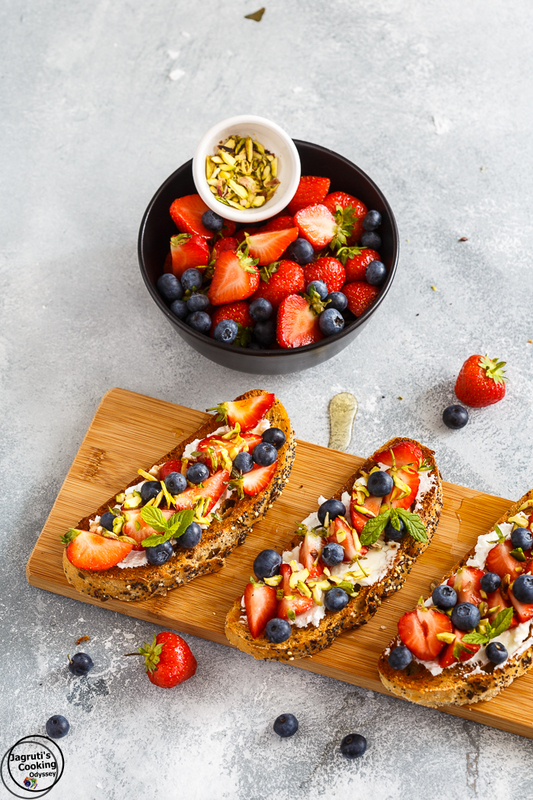 A scrumptious, sweet and savoury, light and refreshing summer appetizer or snack with juicy strawberries, creamy and salty goats' cheese, then garnished with lightly toasted pistachio slivers, balsamic vinegar, maple syrup and mint leaves. Pre heat oven to gas mark 6.Place bread slices on a baking tray, drizzle olive oil on it and bake it for 3-4 minutes on both sides.meanwhile combine cheese, salt and black pepper.Once bread slices are toasted, remove it on a serving dish.Spread the goats' cheese, arrange the berries and sprinkle pistachio slivers. Drizzle some vinegar and maple syrup and garnish it with mint or basil leaves.Serve straight away.Enjoy! These are so colorful, perfect for the 4th! Whoa, this sounds amazing! I love goat cheese on anything, and this flavor combo sounds fantastic. I'm actually going to make these. They look so appetising yum! They are such lovely colours, fruit and goats cheese is a match made in heaven. Mmm I love the sound of this, goats cheese and berries are so good together. This sounds so delicious, love the photos too! These are beautiful! Love the simple combo of fruit, cheese + pistachios and some vinegar! Yum. These are beautiful! Love this combo of berries, cheese, pistachios and some vinegar! Yum! These look so pretty and delicious! What a great flavour combination! We also take the strawberry tops and make syrup out of them - that's where the most intense strawberry flavour is. We spend Summers at our Lakehouse and we always get a late start. This fruit filled toast, with the goat cheese is great because its healthy, and will fill me up, but not stuff me to be able to get out on the boat! Your photos are stunning by the way! The pictures you included made my mouth water. I am always looking for quick and healthy recipes to add to my cook book and I think I may have to try this one. It just looks so good! That looks both healthy and delicious. Just the combo we all want. Thanks for sharing! looks delicious and healthy also. I'm not a fan of goats cheese, do you have a recommendation on something I could swap instead of that, I'd love to try it. You can use ricotta or feta cheese. Wow. Your crostinis look divine. I love goat cheese so I just have to make this for a snack. If no one's home during snack time, then good! I'll have them all to myself. This does appear to be a great independence day dish. All of the colors are present red, white and blue. Also, a good dish when you have your girlfriends over for wine and good conversation. Thanks for sharing. These look so pretty to eat! Great appetiser for a dinner party! Yum. These look so pretty to eat! Great appetiser for a dinner party. Yum! Crostini are one of my favorite types of appetizers to serve tro people. This sweet fruit topping is perfect especially with balsamic as a foil. Gorgeous, super tempting and so colorful!! 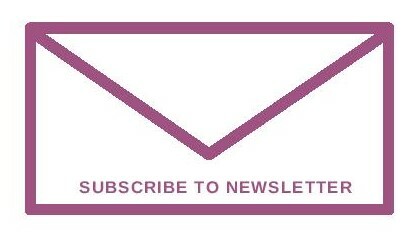 Love all your fabulous clicks! Cant take my eyes from those cathcy fruity and cheesy crostini. Seriously these sort of fruit & cheese crostini never popped on my mind. Am so tempted to make this soon. Woohoo this is such an interesting and creative crostini. The whole dish looks colourful and love to eat anytime !! So many flavours yet such a simple dish! Oh my such beautiful Crostini -- they look soooo colorful and so inviting. I love the goat cheese and strawberry topping -- sweet and tangy at the same time. OMG This is so gorgeous and colourful. Sounds flavourful too..
Drooling here a visual treat. Since I am not sure if we will like goats cheese will stick to what we know. 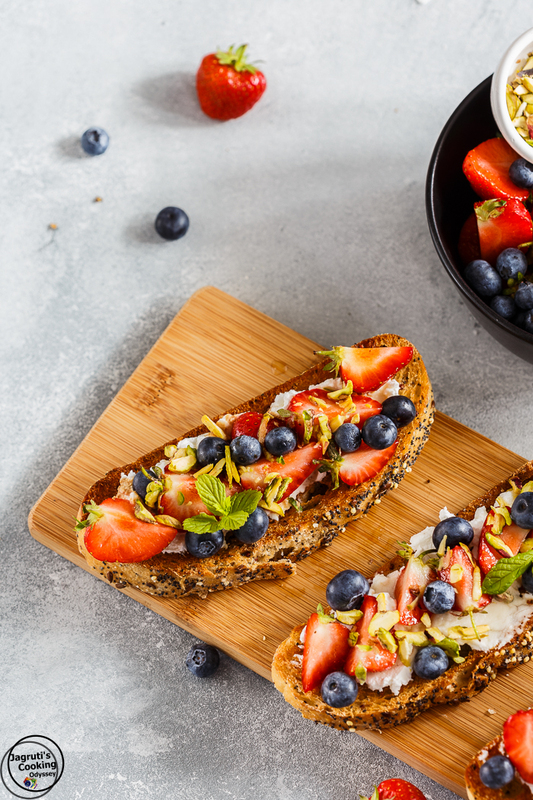 Eating strawberries with leaves is what I learnt today....Look at those gorgeous looking crostini...Can't take my eyes off! !...Strawberries and goat cheese always go well together...great clicks dear!! Looks delicious with all berries on top. Perfect for tea parties. I have never ever tried dessert crostini. Your post is giving me such colorful and refreshing ideas to make these for my girls. They love all kinds of berries in any form. Bookmaking to try after Navratri. yummmmmm, by the very look of it you can feel the delight. I can imagine binge watching cricket and having these gorgeous crostinis one after the other. The best part is they are healthy with a good dose of fresh fruits so one doesn't have to worry too much. I love goats cheese a lot and they pair up wonderfully with fruits. We are super alike on consuming the green part of the strawberries. I add whole strawberries while making milkshakes or smoothies. Husband doesnt notice and I am happy about the nutrition element. Beautiful images and makes me wanna reach out and grab a crostini quickly. So lovely to see each pictures and read your articles Jagruti.. Im crazy with strawberry recipes.. No doubt yours is an absolute yum yum..
Wow, this looks so delicious jagruti, loving it totally. It will be a hit with kids. Such a classy dish Jagruti! I have never tasted goats cheese but going with your description of the dish, I am sure it is something we would love in indulge on!! Such a fabulous combination. Crossitini looks so tempting.Pics are making it more droolworthy.